If there is ever a time of the year to treat yourself, now is definitely it! With all the sales going on, it can be super difficult to not want to take advantage of all the steep discounts and savings on items you've been eyeing all year. 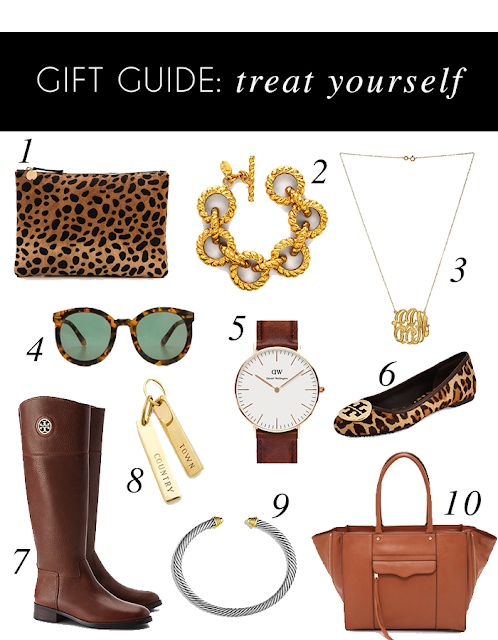 And I'm going to go ahead and give you permission to treat yourself! I never want to put big ticket items on my Christmas and birthday lists because although it may be something I really do want, at the end of the day its totally a frivolous purchase. This is why the phrase, "treat yourself" was invented! Whether it's a pair of riding boots or that leopard print clutch you've been eyeing for months, these larger ticket items are normally going to be investment pieces that stay in your wardrobe for years to come. They'll also be something you enjoy for years because it's something that you bought yourself and is generally higher quality. Happy Shopping & Treat Yourself!